The AFC Divisional playoff game on January 3, 1987 featured the Cleveland Browns, winners of the AFC Central Division, hosting the New York Jets, the second place finisher in the AFC East that qualified for the postseason as a Wild Card. The Browns were coached by Marty Schottenheimer and won the last five games of the 1986 regular season to finish with a 12-4 record. Second-year QB Bernie Kosar (pictured above) had the league’s lowest interception percentage (1.9), being picked off just 10 times while tossing 17 TD passes. The receiving corps was a good one although the running back tandem of Kevin Mack and Earnest Byner, who was out against the Jets, had been disrupted by injuries. A knee injury had cost the team the services of PK Matt Bahr and 38-year-old Mark Moseley, long-time kicker for the Redskins who was released earlier in the season and also was the league’s last remaining straight-ahead placekicker, was signed to take his place. New York, under Head Coach Joe Walton for the fourth year, had gotten off to an impressive 10-1 start before losing five straight games to end up at 10-6. Injuries were a problem, especially on the offensive and defensive lines, and QB Ken O’Brien’s performance dropped off significantly. He was benched in favor of backup QB Pat Ryan, who led the Jets to a win over Kansas City in the Wild Card playoff round. WR Al Toon was an All-Pro and RB Freeman McNeil, when healthy, was very productive. But the injuries on defense played havoc with the ability of the Jets to defend against the pass. There were 78,106 fans in attendance at Cleveland’s Municipal Stadium. The Jets had first possession and punted. The short kick by Dave Jennings had the Browns starting at their 44 and a personal foul on the defense two plays later moved the ball into New York territory. However, after reaching the 29, Cleveland came up empty when Mark Moseley was short on a 46-yard field goal attempt. The teams exchanged punts before the Jets advanced 82 yards in four plays. Pat Ryan threw to Al Toon for 28 yards and WR Wesley Walker for seven before firing to Walker once more on a flea-flicker for a 42-yard touchdown. Pat Leahy added the extra point and the visitors held the early 7-0 advantage. The Browns started at their two following the ensuing kickoff but responded with a 98-yard drive in six plays. Bernie Kosar passed twice to TE Ozzie Newsome for 21 and 23 yards and to TE Harry Holt for nine yards to the New York 42. 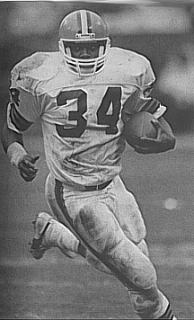 After an offside penalty on the Jets, Kosar went to the air once again, this time to RB Harry Fontenot for a 37-yard TD. Moseley’s point after tied the score. The Jets punted after a short possession and the Browns were on the move as the opening period came to a close with Kosar connecting with WR Webster Slaughter for 15 yards and Newsome for 14. But the drive stalled at the New York 40 and, now in the second quarter, Cleveland was forced to punt. The teams returned to trading punts until the Browns, regaining possession at midfield, advanced 29 yards in seven plays. Kosar completed three passes, the biggest to Newsome for 13 yards and Kevin Mack (pictured at right) for 25 down to the New York nine. However, a holding penalty moved the ball back and the offense could get no further. Moseley booted a 38-yard field goal to put Cleveland in the lead by 10-7. Following another exchange of punts, the Jets took possession at their 31 with 1:29 remaining in the first half. QB Ken O’Brien, now behind center because of a groin injury to Ryan, twice scrambled for gains of nine and 16 yards and completed two passes. With the clock down to seven seconds, Leahy came on to kick a 46-yard field goal and the teams went into halftime with the score tied at 10-10. The Browns had the ball first in the third quarter, punted, and New York started off with good field position at the Cleveland 41. Freeman McNeil ran three straight times for 23 yards but was then tackled for a loss and two O’Brien passes fell incomplete. Still, the Jets took the lead when Leahy kicked a 37-yard field goal that made the tally 13-10. Cleveland responded by driving into New York territory, the big play being a Kosar throw to Holt for 33 yards. But after RB Curtis Dickey ran for three yards, two passes intended for Fontenot were incomplete, the second after being tipped by DT Tom Baldwin, and the Browns came up empty when Moseley was wide to the left on a 44-yard try for a field goal. The teams returned to trading punts for the remainder of the period, with the Browns coming out ahead on the battle for field position. Starting at midfield early in the fourth quarter, Kosar threw to Newsome for a 34-yard gain and a pass interference call on a third-and-six play gave Cleveland a first down at the New York 10. But after Mack carried twice for eight yards, Kosar’s third down pass into the end zone was intercepted by CB Russell Carter. It ended a streak of 133 consecutive passes without an interception for Kosar. O’Brien completed passes to Toon for 11 yards and FB Tony Paige for 10, and McNeil ran effectively as the Jets reached the Cleveland 43 before having to punt. However, they got the ball right back when Kosar was again picked off, this time by CB Jerry Holmes at the Cleveland 25. On the next play, McNeil carried the ball on a sweep to the right and went the distance for a touchdown. Leahy converted and New York was ahead by 20-10 with only a little over four minutes remaining in regulation. 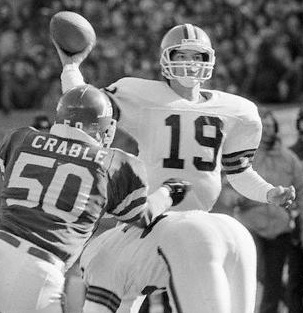 It looked dire for the Browns on the next series as they faced third-and-24 at their 18, but a roughing-the-passer penalty on DE Mark Gastineau earned them 15 yards and a first down and, after two passes were incomplete to set up third-and-10, Kosar connected on five straight throws. WR Reggie Langhorne caught the first two, for 10 and 13 yards, and WR Brian Brennan followed up with receptions for 22 and 19 yards to get the ball to the New York three. Two plays later, Mack scored a TD from a yard out and, with Moseley’s extra point, the visitors’ lead was cut to 20-17. The try for an onside kick was recovered by the Jets and they were able to run the clock down to 1:03 before punting. Starting from their 33, the Browns were helped along by a pass interference penalty that moved the ball to the New York 42. Kosar threw to Slaughter for 37 yards and, after the next pass was incomplete, Moseley kicked a 22-yard field goal with 11 seconds left to tie the score at 20-20 and send the game into overtime. The Jets went three-and-out on the first possession of OT. It looked good for the Browns, starting from their 26, as Kosar completed five passes, the last to Langhorne for 35 yards down to the New York five. But Moseley then missed to the right on a 23-yard field goal attempt and the game continued. Neither team could move on the next few possessions, resulting in punts. Cleveland had the ball at the New York 35 as time expired in the first overtime period and three runs by Mack picked up 26 yards to the nine before Moseley, given another opportunity, came through with a game-winning 27-yard field goal at the 2:02 mark of the second overtime period. The Browns advanced by a final score of 23-20. Cleveland had by far the most total yards (558 to 287) and first downs (33 to 14). 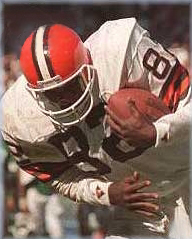 The Browns also recorded nine sacks, three of them by DE Carl Hairston, to four by New York. Cleveland turned the ball over twice, to none by the Jets, but the visitors were flagged 10 times at a cost of 94 yards, to four penalties for 40 yards on the Browns. Bernie Kosar completed 33 of 64 passes for 489 yards, the attempts and yards setting new NFL postseason records, with one touchdown and two interceptions. Kevin Mack rushed for 63 yards on 20 carries that included a TD and also had 5 catches for 51 yards. Ozzie Newsome (pictured at left) had 6 pass receptions for 114 yards and Webster Slaughter also caught 6 passes, for 86 yards. Mark Moseley was successful on three of six field goal attempts. For the Jets, Pat Ryan was 6 of 11 for 103 yards and a TD and, in relief, Ken O’Brien completed 11 of 19 throws for 134 yards. Al Toon caught 5 passes for 93 yards and Freeman McNeil rushed for 71 yards on 25 attempts that included a score along with four pass receptions for 35 yards. Dave Jennings punted 14 times for a 37.9-yard average. Cleveland advanced to the AFC Championship game and lost a close contest to the Denver Broncos, the first of two consecutive conference title game meetings between the clubs that were both won by the Broncos. The Jets dropped to 6-9 in 1987 and didn’t return to the postseason until 1991.